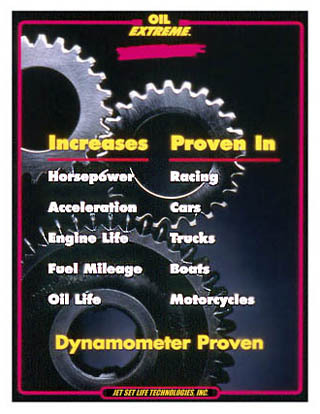 Oil Extreme Concentrate additive works great in all race engines, passenger cars and light trucks. 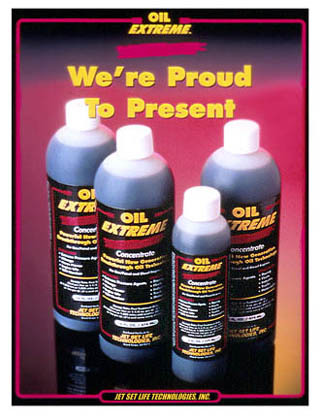 Use 1-2 ounces of Oil Extreme™ Concentrate Additive per quart of your favorite motor oil. Calcium Petroleum Sulfonate Technology Guarantees up to 7 Horsepower Gain and up to 10% extra miles per gallon in passenger cars and race cars. GREAT for HONDA Fit, Jazz, & City SHUDDER Problems. Customers say it cures all shudder problems in CVT gearboxes in as little as 5 minutes. The 16 ounce bottle is recommended. Increase Horsepower with the use of Oil Extreme Motor Oil Additive Concentrated formula for use with your choice of motor oils. When viewed under a microscope, all metal surfaces are rough. University studies suggest the actual contact area of two surfaces is only 10% to 20%. If the microscopic hills and valleys called asperities can be filled with a hard tribochemical film, the load on that metal part can be spread over a much larger area. This will reduce friction and wear up to 10 times. Over the years, ZDDP, graphite, moly, micro metals, PTFE resins, and chlorinated ingredients have been used in the attempt to reduce friction and wear. ALL these ingredients have their drawbacks. Lead has been banned, and other ingredients discredited. Most additive companies won't even tell you what their magic ingredient is. Another horsepower increaser is the special ultra thin oil film which attaches itself to the c alcium carbonate tribochemical film. Every racer knows there is horsepower to be gained by lowering the viscosity of their oil. During dynamic lu brication, whether a 20W-50 or a low 10W-30, whether a synthetic or a petroleum oil, there is drag caused by the shearing of the oil's molecules. With the Oil Extreme™ tribochemical film there is always the "micro molecule" thin oil film which shears first, thereby reducing friction in a revolutionary new way. Calcium Carbonate is already used as an alkaline reserve in all motor oil additive packages. 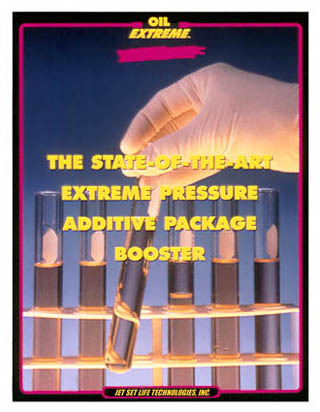 or add excess amounts to the Oil Extreme™ additive package booster. Under heat and pressure this excess calcium carbonate forms an extremely hard tribochemical film that fills the asperities of an engine's metal surfaces. you can now safely extend drain intervals two to three times. You'll also achieve extremely high levels of corrosion resistance, and because of its unique detergent properties keep the inside of your engine spotless. Oil Extreme Concentrate Additive for use in gasoline and diesel engines for trucks, cars, boats, and ATVs. OIL EXTREME™ technology developed by Oil Extreme International represents a departure from current additive formulations by re-engineering conventional overbased calcium petroleum sulfonate to achieve an effective, economical and environmentally responsible extreme pressure agent without the use of chlorinated materials, heavy organometallics or other solid materials suspended in oil. 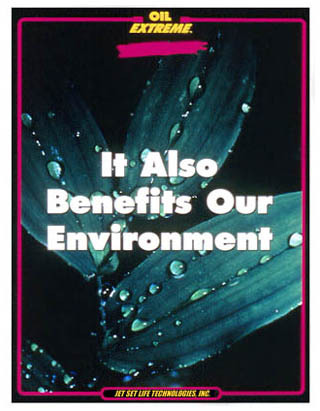 The formulations resulting from the re-engineering process allows OIL EXTREME™ technology to be applied to automotive and industrial lubricants without compromising the proven safety of standard additive packages while at the same time improving the performance and extending the effective life of the lubricant. Despite the current high level of engine oil technology driven by the demand for ever increasing engine design sophistication, the mandate for fewer emissions and less disposal of used oils, demand still exists for additives that address extreme pressure and boundary lubrication conditions that are not being met by the lubricants industry. This vacuum has created a booming aftermarket oil additive industry that has relied upon sensationalized claims and questionable chemistries that put both the consumer and the environment at risk. While their technology is based on debatable chemistry, these companies producing aftermarket additives with extreme pressure properties do have a valid point in that if an extreme pressure property is imparted to a lubricant such as an engine oil, a significant amount of friction will be eliminated. This significant friction reduction will result in, as a matter of course, reduced fuel consumption, reduced component wear, increased power and a reduced tendency of the oil base to oxidize. By re-engineering overbased calcium petroleum sulfonate to impart extreme pressure properties, Oil Extreme International has overcome the problems previously associated with highly overbased calcium carbonate complex chemistries and has developed a safe and effective alternative to chlorinated materials in engine oils, gear lubes, greases and specialty lubricants. While the lubrication industry continues to respond to significant drivers requiring better base oils and additives packages, it is important to note that most current engine oil formulations do not address the extreme pressure requirements of engines. This stems from the conventional formulation philosophy that there are no extreme pressure conditions inside an engine. Even the American Petroleum Institute (API) tests do not call for extreme pressure performance from engine oils, however numerous studies have confirmed the presence of extreme pressure conditions during cold cranking, sudden accelerations, heavy loads and extremely high temperature operating conditions. At best, engine oils are formulated with anti-wear additives which are very "mild" extreme pressure agents. The fact remains that there is much to be gained from incorporating extreme pressure agents in engine oil formulations. There is no argument that extreme pressure conditions do indeed exist in an engine during the course of normal engine operations. This is especially true for modern engines with tight tolerances. To disregard this in formulation works is a great disservice to the motoring public, industry and the environment. Tribology recognizes that the actual engineering surfaces of sliding metals are only 10% to 20% of the actual geometric surfaces. Under extreme magnification, what appears to be a smooth metal surface to the naked eye is actually a landscape of microscopic "hills and valleys" or asperities. The engineering surface, or the 10% to 20% of the geometric surface, is the actual surface in contact with the same engineering surface of another metal. If the "valleys" are covered with a film, known as a Tribochemical Film, such in that the area of the engineering surfaces are increased, the structural load bearing capacity of the sliding metals can be significantly increased. Furthermore, the "hills" that are actually weld points can be smoothed out and effectively reduce the "drag" or coefficient of friction between the sliding surfaces. Even under boundary lubrication conditions and extreme pressure when the oil film can no longer offer any protection, the Tribochemical Film can actually substitute for the lost oil film and protect the sliding metals from welding, deformation or abrasion. In the past, a number of chemicals have been used to create this film. The conventional chemicals used in engine oils are based on sulfur and phosphorus chemistries. These chemistries produce weak films. Previously referred to, ZDDP is a weak extreme pressure agent because it is easily abraded during boundary lubrication conditions and is easily depleted because of its additional role as an antioxidant. Furthermore, it is now under close scrutiny for its toxicity and poisonous effects on catalytic converters, thus its permissible amounts in formulations are being limited. Others use graphite and other solid materials such as Teflon and micro-metal powders suspended in oil, making unsubstantiated claims to their effectiveness while ignoring the tendency for these solids to settle out of suspension and/or agglomerate in oil passageways. Prior to banning its use by the United States, highly toxic lead naphthenate was also marketed. The most sensationalized additives to date are the chlorinated paraffins and related products found in late night T.V. "Infomercial" offerings. These are very strong extreme pressure agents that readily decompose for chlorine to react with metals to form metal chloride films. While effective as an extreme pressure agent, there are a number of serious problems associated with such materials. First of all, chlorinated hydrocarbons work as extreme pressure agents through the reaction of chlorine with iron to form ferric chloride films under critical pressure and temperature. This leaves the decomposed hydrocarbon portion deficient in electrons turning them into sludge precursors. Excess chlorine released during the decomposition reacts with water in the oil to form hydrochloric acid which in turn accelerates the depletion of the alkaline reserves of the oil. Depletion of the alkaline reserve necessitates an early oil change, increasing stress on the environment by adding to the amounts of waste oil in circulation. Secondly, used oil recyclers have problems processing used oil with chlorine content. Chlorine naturally evolves hydrochloric acids that corrode fractionation towers during processing. Thirdly, government regulators are seriously looking at chlorinated paraffins and similar materials for possible regulation. Already, the National Toxicology Program has determined that certain chlorinated paraffins are carcinogenic. Partial oxidation of chlorinated hydrocarbons may form dioxin which is extremely carcinogenic. It must be said that the right kind of chlorinated materials can be properly incorporated into an engine oil formulation in order to take advantage of the extreme pressure property while eliminating the side effects of their decomposition products. However, the overall formulation must be done such that the standard additive package is not compromised and unwanted partial oxidation and decomposition products are not formed. Experienced oil formulators have successfully used chlorine in railroad engine oils and in synthetic oil formulations. Unfortunately, most compounders of chlorinated aftermarket additives resort to sensationalism instead of sound chemistry. Some in fact recommend treatment rates up to 20%, thereby compromising 20% of the required standard additive package as mandated by an appropriate API rating. Oil Extreme International has developed a highly effective, non-chlorinated, non-sulfurized, non-leaded extreme pressure agent based on the calcium carbonate complex technology. Its chemistry is based on conventional, time-tested overbased calcium petroleum sulfonate. Overbased calcium petroleum sulfonate is used traditionally by major additive manufacturers as alkaline reserves or alkaline boosters in engine oils. Its use as the alkaline reserve of choice in engine oil formulations by most oil majors is a testament of its safety as an ingredient in engine oil formulations. Oil Extreme International has re-engineered the conventional overbased calcium petroleum sulfonate such that it acquires an extreme pressure property besides maintaining its inherent alkalinity and anticorrosion properties. The re-engineering process does not in any way alter the basic configuration of the molecules such that the general formula of such molecules is still maintained. This is an important factor because the safeness of the compound as an ingredient in an engine oil formulation is derived from the expensive No-Harm Test done by the oil majors on their conventional overbased calcium petroleum sulfonate. The extreme pressure property of calcium carbonate complexes in the OIL EXTREME™ technology is a function and balance of the following attributes. Molecular diameter of the carbonate in the micelles. The interplay and balance of the four attributes are critical. The success of Oil Extreme International is in its being able to determine the critical constants, ratios and numbers based on tribological theory of its own. It is this working theory that separates Oil Extreme International from the others, making it possible to formulate an effective extreme pressure agent from overbased calcium petroleum sulfonate where others have failed. 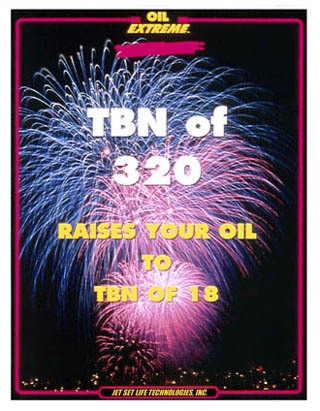 The traditional overbased calcium petroleum sulfonate used by the oil majors in conventional engine oil formulations have TBN values of 300 or less. These compounds exhibit very little extreme pressure property. There are off-the-shelf overbased calcium petroleum sulfonates in the market today with TBN values of 400 or more, but they are either crystalline or have carbonate molecules in the micelles which do not have the critical numbers in the size distribution curve. Moreover, the sulfonate to carbonate ratio has to be just right in order to maintain stability of the micelles in the final oil formulation. 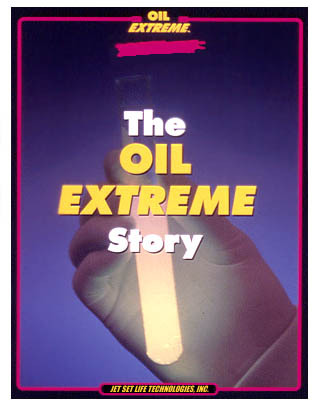 OIL EXTREME™ technology offers a number of advantages over the highly sensationalized aftermarket extreme pressure additives based on chlorine chemistry. First, when the calcium carbonates separate from the complex to form the Tribochemical Film on the surface of the metals, the remaining molecule, calcium petroleum sulfonate, becomes a strong detergent. This enhances the detergency and dispersancy of the engine oil. In the case of chlorinated paraffins, the dissociated hydrocarbons become free radicals that turn into sludge precursors. Secondly, any free calcium carbonates that are either abraded from the Tribochemical Film or dissociated from the complex, become active alkaline that boost further the TBN reserves in the oil. Thirdly, the calcium petroleum sulfonates are polar molecules. The sulfonate pole of the molecule bonds to the metals during hydrodynamic lubrication while its light petroleum end, an alkylate, forms the contact with the oil, forming a secondary film that provides a lower coefficiency of friction between itself and the oil film. This has tremendous implication on the governing coefficient of friction of the oil in a hydrodynamic regime. This is especially significant in heavy duty engines. Lower coefficient of friction, of course, would mean reduced energy consumption and improved fuel economy. The re-engineering of calcium petroleum sulfonate complex by Oil Extreme International to create the OILEXTREME™ technology not only raises the bar in extreme pressure protection formulations but also represents an environmentally responsible alternative to the use of hazardous substances in automotive and industrial lubricants to increase performance. 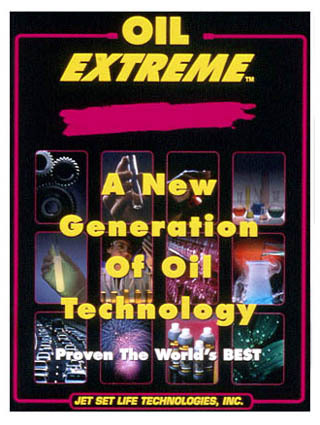 Oil Extreme International has been responsible for introducing OIL EXTREME™ technology in ever-increasing testing and use in NHRA top Fuel Funny Cars and Pro Stock motorcycles, NASCAR Sprint Cup, Nationwide Series, and World of Outlaws Sprint Cars, as well as many other forms of racing. In the UK, it is used in Formula 3, and the OILEXTREME™ Formula 600 Championship Series. There and in the US, it is used in Go Karts,as well as many other forms of racing on the continent. A following also is growing in AMA Grand National motorcycling, Motocross, and Snowmobiles. Some national records have already been set in many forms of racing, Engine builders report smoother running engines, lower operating temperatures, and little or no wear evident at routine teardowns. Ongoing and additional field trials continue to demonstrate the effectiveness of OIL EXTREME™ technology in a number of applications using engine oils, gear lubes, greases and specialty lubricants. Results indicated improved fuel economy, reduced heat and improved equipment performance. Contact Oil Extreme International LLC. for further information. This was achieved with the NEW OIL EXTREME ONLY. No Triple Charger was installed on this vehicle. This 3.4 HP increase will make a big difference in this 1.3 liter engined Ford Aspire. It has to get better Gas or Petrol mileage, plus better acceleration and power. Nine baseline tests were done to make sure we had proper baseline, then each test was done three times to verify accurate figures. With increases like this,OIL EXTREME has to be a winner. Motor Oil Additive Concentrate Case of 6-16 fluid ounces.